Plain Jane is found primarily in handled baskets. The "official" version has subtle flutes, like that at left. 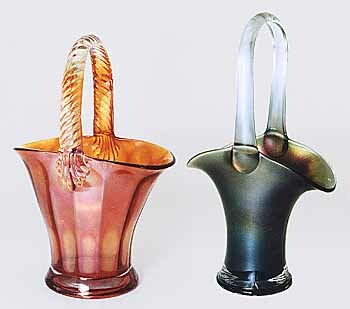 However, plain baskets, usually with stretch iridescence, are also referred to as Plain Jane. Actually, any plain basket, bowl or compote is subject to being labeled Plain Jane, so some confusion is inevitable.